The black 18 x 24" LED Light Panel from Gagne/Porta Trace is a very thin and completely portable way to have a reliable, evenly lit working surface with you at all times. The panel is illuminated by two strips of bright white LED diodes that provide edge-to-edge illumination. The strips have a rated life of 50,000 hours and do not require much power to operate. The unit is made from durable anodized aluminum and supported by a strong plexiglass viewing surface. It works in either horizontal or vertical orientation and can be wall mounted for added convenience. It can be operated on either 100 or 240V power (50/60Hz) and only requires an optional plug adapter if used outside the US. The power cable is removable and can be stored in your briefcase for easy transport. 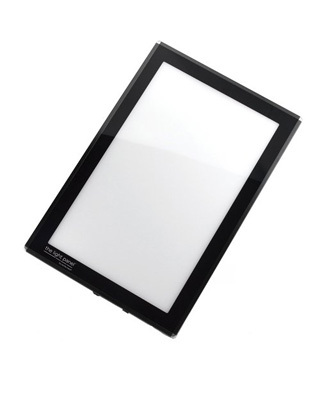 The LED Light Panel is made by Porta-Trace/Gagne and comes with a one-year warranty.